What might have been the biggest physics story of the past century may instead be down to a faulty connection. In September 2011, the Opera experiment reported it had seen particles called neutrinos evidently travelling faster than the speed of light. The team has now found two problems that may have affected their test in opposing ways: one in its timing gear and one in an optical fibre connection. More tests from May will determine just how they affect measured speeds. 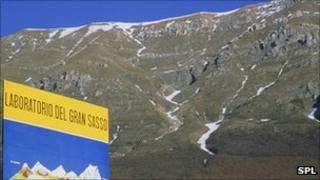 The Opera collaboration (an acronym for Oscillation Project with Emulsion-Racking Apparatus) was initially started to study the tiny particles as they travelled through 730km of rock between a particle accelerator at the European Organization for Nuclear Research (Cern) in Switzerland and the Gran Sasso underground laboratory in Italy. Its goal was to quantify how often the neutrinos change from one type to another on the journey. But during the course of the experiments the team found that the neutrinos showed up 60 billionths of a second faster than light would have done over the same distance - a result that runs counter to a century's worth of theoretical and experimental physics. The team submitted the surprising result to the scientific community in an effort to confirm or refute it, and several other experiments around the world are currently working to replicate the result. A repeat of the experiment by the Opera team will now address whether the issues they have found affect the ultimate neutrino speed they measure. The two problems the team has identified would have opposing effects on the apparent speed. On the one hand, the team said there is a problem in the "oscillator" that provides a ticking clock to the experiment in the intervals between the synchronisations of GPS equipment. But the team also said they found a problem in the optical fibre connection between the GPS signal and the experiment's main clock - quite simply, a cable not quite fully plugged in. The team had carried out their measurements for more than three years, exhaustively scrutinising their methods and analysis before announcing the results last year - so why had they not found these issues before? "It's sometimes very difficult to tell whether this thing could have been done before - because in a sense the answer is always yes," said Sergio Bertolucci, director of research at Cern. Prof Bertolucci outlined the complexity both of the experiment and the analysis of the results, stressing that the hunt for just these kinds of problems had been relentless. "One has to realise that the collaboration has never stopped to try to 'kill' the measurement (proving that it was erroneous)," he told BBC News. "Their constant search for systematic (errors) has never stopped, for more than a year." Given that the opposing effects only seem to muddy the waters further on whether neutrinos can exceed the "universal speed limit", only more experiments will put the matter to rest. For its part, the Opera team said in a statement: "While continuing our investigations, in order to unambiguously quantify the effect on the observed result, the collaboration is looking forward to performing a new measurement of the neutrino velocity as soon as a new bunched beam will be available in 2012." Facilities also at Gran Sasso called Borexino, LVD and Icarus will also take part, along with Minos, based at Fermilab in the US, and possibly a Japanese facility called T2K. With so much at stake, Oxford University particle physicist and Minos UK spokesman Alfons Weber said these international efforts will go ahead no matter what. "I can say that Minos will quite definitely go ahead," Dr Weber told BBC News. "We've already installed most of the equipment we need to make an accurate measurement. "Even if Opera now publish that 'Yes, everything is fine', we still want to make sure that we come up with a consistent, independent measurement, and I assume that the other experiments will go forward with this as well." But Prof Bertolucci at Cern says that there are wider implications of the neutrino story, which is playing out in the public eye. "All this story has shown to the wider public how science works," he said. "Of course the people of Opera are not happy; they would have preferred that the neutrinos stayed [faster than light], but the fact that they came out and they put themselves to the scrutiny of the wider collaboration... I think makes a good case for science."